$21.00 NOTE: Our shopping cart is disabled. We are using it to display affiliate items which if you click on PURCHASE in the PRODUCT INFORMATION by scrolling below or click on the Amazon banner the RRDi receives a small affiliate fee upon completion of your purchase. Mahalo. ✅ START IMPROVING YOUR SKIN TODAY, RISK FREE – You’ll love our anti aging, redness fighting serum more than other rosacea skin care products or simply email us within 30 days for a full refund – sound fair? Order today for fast shipping and try it the second it arrives! You shouldn’t have to settle for anti aging systems that irritate your sensitive skin or make your rosacea symptoms—like facial redness, broken capillaries, ocular rosacea, flushing, acne and blemishes—worse. Unfortunately, many rosacea creams, rosacea skin care products and especially many of the best anti-aging serums can actually worsen your skin and make you want to hide your face. 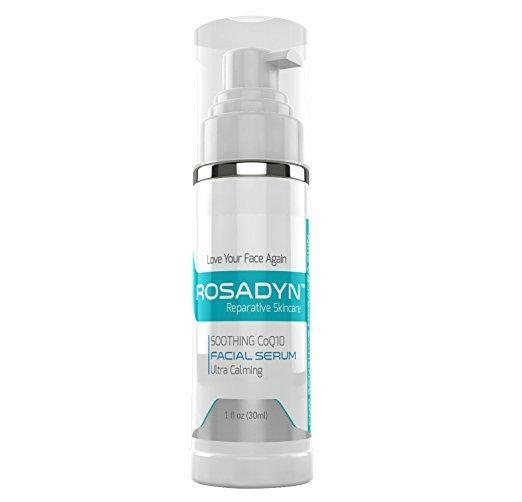 After years of success with Rosadyn—our natural rosacea supplement that targets the root cause of your rosacea symptoms—we decided to expand our product line to include a soothing anti aging serum that actually reduces your facial redness and strengthens your skin, reducing its sensitivity. This revolutionary facial redness reducer contains a synergistic blend of ingredients clinically proven to calm skin, reduce signs of aging and diminish redness. Flawless skin shouldn’t have to cost you a fortune. Our serum is packed with the latest cutting edge, premium all natural and organic ingredients at an affordable price. We also eliminated common skin irritants like phthalates, parabens, sulfates, added fragrances, and petroleum. Start loving your sensitive skin again with our fast penetrating, silky, lightweight moisturizing facial serum. Order today with confidence given our 100% risk free 30 Day Money-back Guarantee.